I have noticed a rush of Chapter 13 filings lately that never make it past the starting gate. The client gets the relief of the automatic stay, but not for very long. It seems that lately there is a lack of sincerity with regard to Chapter 13 filings. This trend is counterproductive to realizing the benefits of Chapter 13. This trend is mostly seen but not exclusively seen with non-payroll control debtors. One of the many benefits of filing Chapter 13 is to recover a vehicle which has been either repossessed or impounded by either a finance company or by the city of Chicago. By filing Chapter 13, the debtor has a temporary lease on life so to speak. The debtor’s driver’s license is eligible for reinstatement and the debtor’s vehicle is available for return to the debtor. However, if a Chapter 13 does not last more than one to three months, then the debtor is simply back in that same situation. Further, now the debtor has a Chapter 13 bankruptcy filing on his credit report without much of a benefit. The debtor is simply playing cat and mouse with a creditor, a state regulation or a city ordinance or by law. Believe me when I tell you, the Secretary of State in Illinois will re-suspend a driver’s license very quickly. Additionally, the city of Chicago and other municipalities will put you back on their boot or impounded list very quickly after a Chapter 13 is dismissed. For these reasons, it makes perfect sense for a debtor to make his best effort when it comes to making plan payments and complying with the bankruptcy requirements. I mentioned earlier that this is most common in debtors that are not on payroll control. Payroll control is where the debtor has the trust, the fee, or monthly payment deducted immediately from his paycheck. In these cases, the debtor does not have the ability to not pay the trustee. The debtor simply has whatever is left out of his paycheck after the trustee and ordinary taxes are paid. It is with the non-payroll control clients where I’m seeing the greatest amount of failure and a tremendous amount of poor judgment. Often times, the debtor will seem completely sincere in the initial interview regarding bankruptcy. A debtor will lead you to believe that he has the ability to make the payment, the willingness to make the payment and the desire to make the payment to protect himself from creditors. The trend I see lately is more likely dishonesty than an actual failure to implement. This failure by a debtor who is trying to game the system temporarily, rears its head very early in the process. For example, a debtor must attend a 341 meeting of creditors approximately 4 to 6 weeks after the case is filed. The debtor receives ample notice regarding the meeting from the clerk of the U.S. Bankruptcy Court, the Chapter 13 trustee and his attorney. There is also plenty of leeway in terms of notice and when the actual meeting will take place. The meeting is also conveniently located in the very county or highly accessible downtown area where the debtor lives.However, a debtor who is not on payroll control happens to miss those 341 meetings with much more frequency than clients who are on payroll control. It all points to a lack of commitment in terms of finances and in terms of making the plan work. d those being supported with the help of family. In summary, if you are a debtor looking to benefit from Chapter 13, make your best effort to have your case succeed. 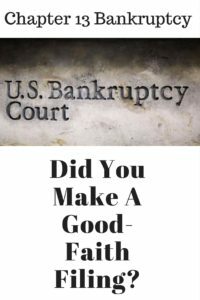 If you are simply trying to game the system, you will soon find yourself back in the same position you were prior to filing except now you will have another bankruptcy appearing on your credit report. Since everyone seems to be very concerned about credit, it would make sense to make the best effort possible when filing for Chapter 13. For more information on Chapter 13 bankruptcies and how my office can assist you in the process, please call 847-520-8100. The information that you receive about filing will be highly valuable. Go to sleep.